Owens Corning FOAMULAR 250 Extruded Polystyrene (XPS) Insulation is a closed cell, moisture-resistant rigid foam board well suited to meet the needs for a wide variety of building applications. Designed for masonry cavity wall applications, FOAMULAR extruded polystyrene (XPS) insulation is virtually impervious to moisture. Available in a tape sealed joints or canned foam sealed joints system. Owens Corning FOAMULAR High-R CW Plus insulation combines outstanding moisture resistance with excellent thermal performance. From foundations to roofs, and with the walls in between - Owens Corning has a complete library of solutions for your building enclosure needs. Engineered with Owens Corning technical expertise and backed by Building Science, Owens Corning® Enclosure Solutions deliver buildings that perform without compromising design. 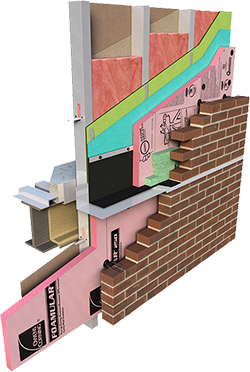 All-purpose foam panel insulation for masonry and other applications. Owens Corning FOAMULAR® 150 extruded polystyrene insulation is ideal for wall furring, perimeter/foundation, cavity wall, crawlspace, pre-cast concrete, under slab, sheathing and other applications.